Shopping for a new Honda HR-V? 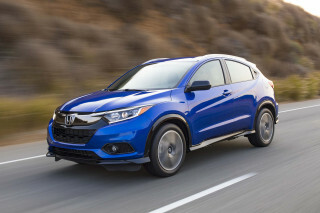 Skip the 2019 Honda HR-V Sport in favor of the value-packed EX with its active safety tech. 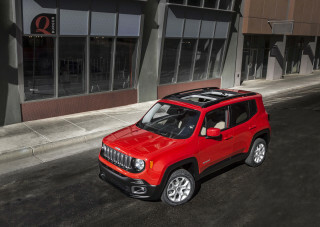 Not all crossover SUV buyers want a big, lumbering off-roader. And not all compact car buyers seek a low seating position. 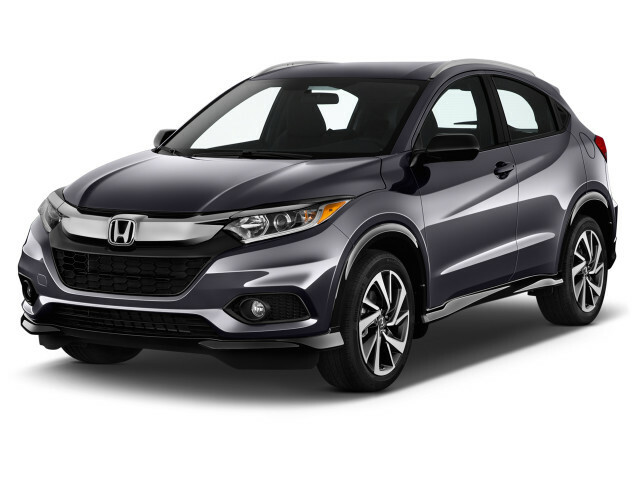 For those looking for something in the middle, there’s the 2019 Honda HR-V.
For the 2019 model year the HR-V gets some subtle styling changes, new Touring and Sport trims, and more standard active safety technology. The HR-V may not have looks on its side, but it is full of personality. Five trim levels—LX, Sport, EX, EX-L, and Touring—leave shoppers with plenty of choices. All share a 141-hp 4-cylinder that provides decent around-town punch but runs out of steam at highway speeds. Decent handling and a comfortable ride give the HR-V a bucks-up feel on the road. 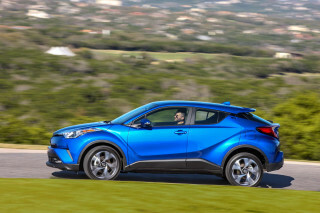 Last year’s manual transmission is a goner, replaced by a competent, well-tuned continuously variable transmission (CVT). At up to 30 mpg combined, the HR-V is thrifty, but we’d like to see a hybrid option. All-wheel drive is optional for snow-belters, but the HR-V is hardly a four-wheeler like its Jeep Renegade and Subaru Crosstrek rivals. Instead, the ace up the HR-V’s sleeve is its interior packaging. Front-seat riders have decent space and plenty of cubbies, while the back seat can accommodate a couple of basketball players. When called upon, the rear seat folds completely flat or its bases tilt up for myriad storage solutions. The HR-V’s 24.3 cubic-foot trunk is more in line with compact rather than subcompact crossover SUVs. This year, EX and higher trims gain a suite of collision-avoidance technology including automatic emergency braking and adaptive cruise control. The new Sport trim has a zippy look with its 18-inch wheels, while the range-topping Touring brings to the HR-V navigation, a power driver seat, and LED headlights. The 2019 Honda CR-V’s weird looks outside give way to a simple, attractive cabin. The 2019 HR-V blends coupe and crossover design cues, but not in a way that’s especially compelling. The massive swoop stamped into the HR-V’s side moves forward into the grille at one end and digs into the rear door handles at the other. It’s not dull, but its complexity doesn’t do it any favors. This year’s new HR-V Sport trim level features 18-inch alloy wheels and replaces much of the chrome trim in other versions with shiny black panels. It works the best of the bunch, but only by a hair. The HR-V’s tidy interior is a high point, though. Its simple, elegant lines stand in contrast to the busy exterior. A wide swath of contrasting, soft-touch material dresses up the dashboard, but the trio of slim air vents in front of the passenger feel like an afterthought. Most trims use a 7.0-inch touchscreen for infotainment (now with a volume knob rather than last year’s slider) that’s integrated nicely into the design. The haptic automatic climate controls on EX and higher trims look flashy but can be frustrating to use. There’s no way around it (or the traffic in front of it): the 2019 Honda HR-V is slow. 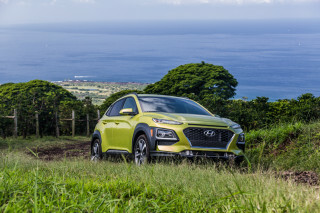 Its 1.8-liter inline-4 is smooth and works well with the continuously variable transmission (CVT), but its 141 horsepower and 121 pound-feet of torque are tasked with moving upward of 3,000 pounds. The HR-V works well enough around town and it’s aided by its quick, responsive steering. On the highway, it can feel nervous and it struggles up even gentle grades. A bright point is the HR-V’s compliant ride. At city speeds, it takes meteor-size potholes in stride. We’ve not yet driven an HR-V with the 18-inch wheels included with the Sport trim, so we don’t know what impact they’ll have. Underneath, front-wheel-drive HR-Vs use a simple torsion-beam rear axle while all-wheel-drive models move to a more sophisticated deDion setup. Either way, the HR-V confidently slices through curvy roads but never feels as entertaining as the Mazda CX-3. Oddly, front-drive HR-Vs sit higher off the ground than all-wheel-drive versions. Stick to paved roads. There’s magic in the 2019 Honda HR-V’s configurable rear seat. The trick feature here is the HR-V’s folding rear seats, which Honda dubs Magic Seats. The bench is hinged to allow the bottom to fold upward for a low load floor directly behind the front seats. When the backrests are folded down, the HR-V has a flat cargo area long enough for shorter folks to sleep in. Up front, the HR-V’s seats are comfortable but the seat bases could be longer and the available moonroof cuts into head room. Rear-seat riders have nearly as much leg room. Most trims feature cloth or vinyl trim on the door panels that helps them avoid the cheap look and feel of hard plastics found in so many subcompact crossover SUVs. The 2019 Honda HR-V improved its safety record over last year. The 2019 Honda HR-V has good safety scores and most versions come with active safety tech. EX and higher trims now come standard with automatic emergency braking, adaptive cruise control, and active lane control—features not available last year. The NHTSA rated the HR-V at five stars overall, with four stars for rollover and four stars for frontal crash performance. The IIHS rated the HR-V a Top Safety Pick when fitted with the LED headlights that come on the Touring trim level. 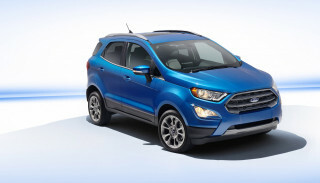 Other versions with the standard halogen headlights produced what the IIHS said is "Poor" light effectiveness. The 2019 Honda HR-V packs a lot of tech into a small package. The base HR-V LX comes with a 5.0-inch display for its audio system, power features, and 18-inch alloy wheels—but that’s about it. This year’s new Sport trim builds on it with 18-inch wheels, a much-needed 7.0-inch touchscreen for infotainment with Apple CarPlay and Android Auto compatibility, roof rails, and a leather-wrapped steering wheel. For about $23,200, it’s decently equipped. Our pick of the line is the HR-V EX, which costs about $24,700 and adds in active safety tech, a moonroof, keyless ignition, heated seats, automatic climate control, and tinted rear windows. Leather seats and a few other goodies add $1,600 and make up the EX-L trim. LX, Sport, EX, and EX-L trims can all be fitted with all-wheel drive for an additional $1,400. The range-topping HR-V comes standard with all-wheel drive plus navigation, an 8-way power driver’s seat, a garage door opener, and LED headlights for a hefty $29,500. The 2019 Honda HR-V is about average for subcompact crossover SUVs when it comes to fuel consumption. Stick with front-wheel drive and those figures climb to a more respectable 28/34/30 mpg. Some rivals use less fuel. 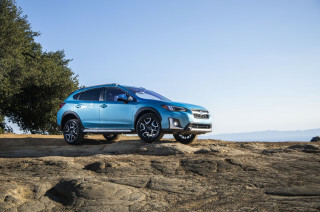 With all-wheel drive, the Subaru Crosstrek and Mazda CX-3 rate well at 29 mpg combined. The front-wheel-drive Nissan Kicks is rated at a heady 33 mpg. Some compact crossovers are more efficient than the HR-V. For instance, the base Honda CR-V LX with all-wheel drive is slightly thriftier at 27/31/29 mpg.